The dining Hall is up the stairs, through the glass doors. Here monks, nuns, novices and workers eat together. Often guests join the Temple staff for meals. At the far end is the Dining Hall Shrine. The Buddha on the Shrine is Maitreya, the coming Buddha. Every Chinese Buddhist Temple Dining Hall has a Shrine with Maitreya Buddha on it and is called “The Hall of Five Contemplations”. Maitreya Buddha is portrayed as a fat, laughing monk with a large sack, sometimes surrounded by playful children. His is the most widely recognized Buddha image in the West and many believe he is the one and only Buddha. Some Westerners also believe he is the Buddhist God. This is not true. In fact, Buddhists believe there have been and still will be, infinitely many Buddhas. Buddhists do not believe in an omnipotent, omniscient God of creation. According to Buddhist belief, Maitreya is presently a Bodhisattva, named Ajita, living and teaching in the Tushita Heaven. A Bodhisattva is a being who has attained great compassion, wisdom and virtue but has delayed becoming a Buddha in order to help alleviate the suffering of all other beings. The Buddhist statues and pictures symbolize and remind us of the virtuous characteristics of the great beings. These qualities are also latent in ordinary people and can be mindfully cultivated so that we become the best people we can be. 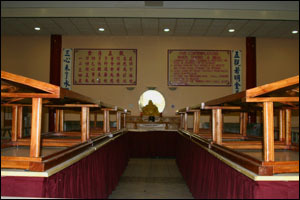 The five contemplations, on the wall to the left of the shrine in English, and on the right in Chinese, are to be reflected upon as one eats in silence. Eating is regarded as an opportunity to develop self-awareness and gratitude. Some monastics take only two meals a day: breakfast and lunch, taking only liquids after midday. One of the reasons for this is that it is not practical for monks, who beg for their food, to go out on alms rounds more than once a day. Another is that it is believed that we do not need to eat three times a day and that we are healthier and can make greater spiritual progress if we do not over eat. We meditate better and need less sleep.